HARD HITTING DETROIT LIONS FORUM - View topic - Interesting Article. Yes, please read it and forget 90 percent of it. Restructure Staff and Suh if you can. There's no way to get the vets he's talking about with the current cap issue unless they do. If Houston is your number 1 you're in trouble and there's no way I'd give him number 1 money. Avril is a product of the rest of the D line. No way I'd give him the money he thinks he deserves. I love Delmas but he's always on the trainers table and to suggest Mattheu is a good pick in a locker room that is NOTHING like New England's with strong leadership is foolhardy. Put a chronic pothead in a locker room with a bunch of guys that got arrested for pot issues a year ago. Yeah, that's smart! The bottom line is that Mayhew and Lewan have done a historically bad job preparing for this season. There's no way they should have this many free agents in the same year. It's going to take a couple years to dig out of this hole. That doesn't mean they can't be a decent team or even a playoff team this season with the right moves but they're not exactly loaded with picks this year so they're going to have to fill a lot of holes via free agency. And that's only going to happen if a couple people restructure. In the bottom are article snippets, he suggested both players SHOULD. An we're all aware of asking these guys to be the bigger men and doing so, is unlikely unless they value a championship. Your attacking the article as if his suggestion is a stupid idea. He doesn't control them or they're agents. He's just putting it out in the universe and speaking out loud for everyone on this board. Not one time did this guy suggest paying either Houston, Delmas, or Avril a contract with #1 money. I completely agree, none of these guys deserves that. Houston isn't Revis, Delmas is a poor man's Bob Sanders in more ways than one and Avril is a product of Suh, Fairley, and Williams which some sucker team will find out shortly. But if there's a way to get any of them under a reasonable contract than do so. He suggested Mathieu is a good sleeper pick but RISKY, which he pointed out and believes this kid won't fall into those mistakes because like some of the past trouble makers he had football taken away from him earlier in his career and knows what's at stake. We can pass on him in the 4th Rd and he could produce like Janoris Jenkins did for another team. The bottom line is these are all band-aid fixes and wishful thinking in some cases doesn't mean it's not a good read or horrible suggestions, sounds better than what Mayhew has done thus far. But in one case unfortunately I agree with him. If we're trying to be competitive this year, focus on bolstering our offense another season and try to outscore opponents, because this defense is unfixable with all the holes. The difference of last year and our 10-6 season, we wasn't scoring as much. So even average to poor offensive teams was beating our defense and the offense couldn't put up enough against the offense. Build our offense to have know glaring holes through F.A. and draft. Make a fantasy football owner want to put our entire offense on his team, Lol!! So draft Fisher or Joekel, bring in the best change pace back by F.A. or draft and solidify all the offensive holes and go for broke while u slow build the defense. Sounds horrible, but that's were we stand in our current situation. *Stafford struck a goldmine by coming out of college just before the rookie wage scale went into effective. How badly does he want to win a championship? How badly does he want to win it in Detroit? From all indications, both are very important to him. If so, it's time to prove it. His agent, presumably, will disagree, but it is on Stafford to help this club manufacture additional cap room to put more talent around him. In a salary-cap world, this is what good teammates, incredibly wealthy teammates, have to do. Defensive tackle Ndamukong Suh is in a similar position with an $18.1-million cap hit. He could stand up and help the cause by reworking his contract, too. *Re-sign cornerback Chris Houston and, if his ailing knees pass the physical, safety Louis Delmas, too. Taking away two key pieces of an already soft secondary would be a disaster. *Assuming the price tag for defensive end Cliff Avril is going to get too high, which it appears will happen, don't pay it. *Somebody is going to benefit from taking a shot with Mathieu. He hit bottom after being kicked off the LSU team last year because of a drug problem. The difference between him and some other players with character risks is that he already had the game taken away from him for a year. That should have been a life-altering experience for him. 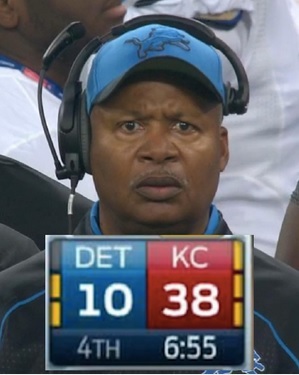 The question is whether the Lions will be willing to take this chance? There's still a natural cautiousness around Allen Park after all those arrests a year ago and then the Titus Young saga last season. But this team is going nowhere without some playmakers and Mathieu is a definite playmaker. If I'm the Lions and I have interest in Tyrann Mathieu, I would sit the lad down and point out what JUST happened to Titus Young, a player with obvious talent and a knack for being a douchebag in the locker room. Mathieu won't even have that much leeway with his history, and if he drops to the sixth or seventh round, then take a chance on him for DB depth and the return game. I agree about Mathieu. I have read a few articles about him, and they pretty much all say that he hit bottom when got released from the team and has essentially changed the types of people who surround him. If memory serves, he has cleaned up and hasn't had any troubles since his dismissal. Obviously I don't know if he has actually changed his ways, but he's at least saying the right things. I wouldn't be upset if the Lions drafted him, as long as they did their due diligence to see if he truly has changed. Right now Mathieu is projected 3rd -4th round, so he's not a cheap risk. I'd be very careful looking into him. His big issue was weed and people with addiction issues a lot of times just replace one thing with another or they relapse once they feel safe. I don't think if I'm the Lions I would want to be going in such a publicly risky direction after so many previous incidents with the team. On the other hand, he looks to be a pretty damn good player. And that last sentence makes him a very good gamble with a 4th round comp pick. But the difference is this guy is going out and expressing his true feelings. He's stated that he found god and began to count his blessings, and I believe he's grown up. He has rare ability, fantastic hips, great return ability, and the overall talent to start from the second he's drafted. If its a comp pick, I'd take him immediately in the 4th. If its a comp pick I'm all for it, but that's basically a 5th rd pick and he probably won't get even remotely that far down in the 4th if he even makes it to the 4th.